Poll: Who will win this year's All-Ireland senior hurling championship? The league is done but who’s going to triumph in the championship? Who'll get their hands on this prize in September? CLARE’S DRAMATIC WIN yesterday in Thurles brought the curtain down on the springtime hurling action. The focus now switches to championship fare with the Leinster round-robin series having already begun and the opening shots in Munster set to be fired on 22 May. 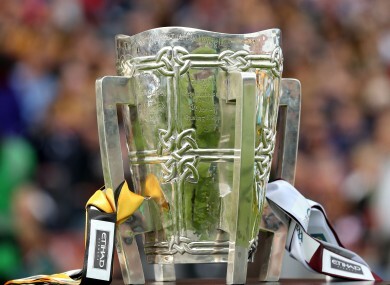 But we want to know who do you think will be lifting the Liam MacCarthy Cup in September? Kilkenny are the bookmakers favourites to retain their title with 2010 champions Tipperary next in line. Then there’s league kingpins Clare, the Waterford team that fell just short yesterday and last year’s All-Ireland finalists Galway. Will the winner come from that quintet or can you see another force emerging like Limerick, Cork or Dublin? Email “Poll: Who will win this year's All-Ireland senior hurling championship?”. Feedback on “Poll: Who will win this year's All-Ireland senior hurling championship?”.